Grimaldi Lines' Short Sea Network is at the centre of continuous developments, with substantial investments in new Ro/Ro and Ro/Ro-Passenger ships aimed at opening new routes to support those already established on which millions of tonnes of goods are shipped. Every week thousands of trucks and trailers, which previously tended to use the motorway network, have opted for the Group's maritime Network, thus contributing to the reduction of traffic and air pollution in Europe. 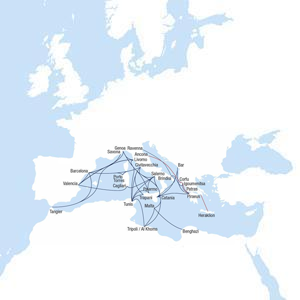 With 18 ships deployed on it, the Short Sea Network extends its reach in both the East/West and North/South directions: the most recent developments are the new maritime links established between Italy (including Sicily and Sardinia) and Spain, Tunisia, Libya, Morocco, Malta and Greece. While strengthening its services in the Adriatic Sea, the Group is now able to serve the Balkan markets for their shipments to Spain and vice-versa through the partnership with Minoan Lines. Trucks can board the Minoan ships in Igoumenitsa or Patras, disembark in Ancona, drive overland a few hundred kilometres to Livorno or Civitavecchia, and then board a Grimaldi ship to Barcelona or vice-versa. Indeed, this "long-bridge" concept is yet another contribution by the Grimaldi Group to the development of alternative EU Corridors aimed at minimising air pollution and road congestion.